Security of the customer’s websites seems to be one of BlueHost’s goals and they claim to offer a qualified support to help the sites make a success. According to Blue Host, their facilities and technology is what really makes that possible. Their headquarters total 50,000 sq. feet along with 2 data centers more than 20,000 sq. feet of space. They utilize their own servers, 10 GB fiber network worldwide, custom linux kernel, operate on diesel generators, UPS power. Thus if a problem occurs they don’t use outsourced services and handle issues by themselves. BlueHost provides hosting services to private users and businesses, to novice and advanced clients, for those who require both a complete and cheap hosting solution. With that they also promise to give a good support, flexibility and speed. Below are the highlights of what they offer. Below you can read BlueHost reviews submitted by our site visitors who were (or used to be) BlueHost customers at the time of writing the review. I have several blue host accounts and multiple sites. They have been easy to set up and when I need help Blue host is right there to help me. It’s been a good fit for me. Thanks BlueHost. Nov. 2013: BlueHost no longer offers the “free domain for life” as listed in the article. I hung up and kept on looking, as this results in a substantial price difference, and should be corrected in the review of this company. I was with them for exactly one day trying to set up a real estate site. They have issues with some WordPress templates. 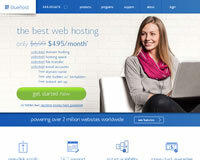 I installed WordPress and a WordPress real estate template from the Bluehost site. Their tech support couldn’t sort out the technical issues that arose although they did acknowledge that there were known problems. On the plus side, they promptly refunded my money, $123/yr. + $50 for the template.